I had the pleasure in meeting Doug Poole at the beginning of this year where he was one of the poets who performed in the Pasifika Stars of Poetry event. His poetry explores his cultural heritage, embraces his family background and propels his political perspectives. Earlier this year, I was lucky enough to get some of my poems published by Doug Poole on the poetry e-zine Blackmail Press. For that I am utterly grateful. Doug produced the performance poetry show POLYNATION, performing at Queensland Poetry Festival 2008 and Going West Writers and readers Festival 2008. 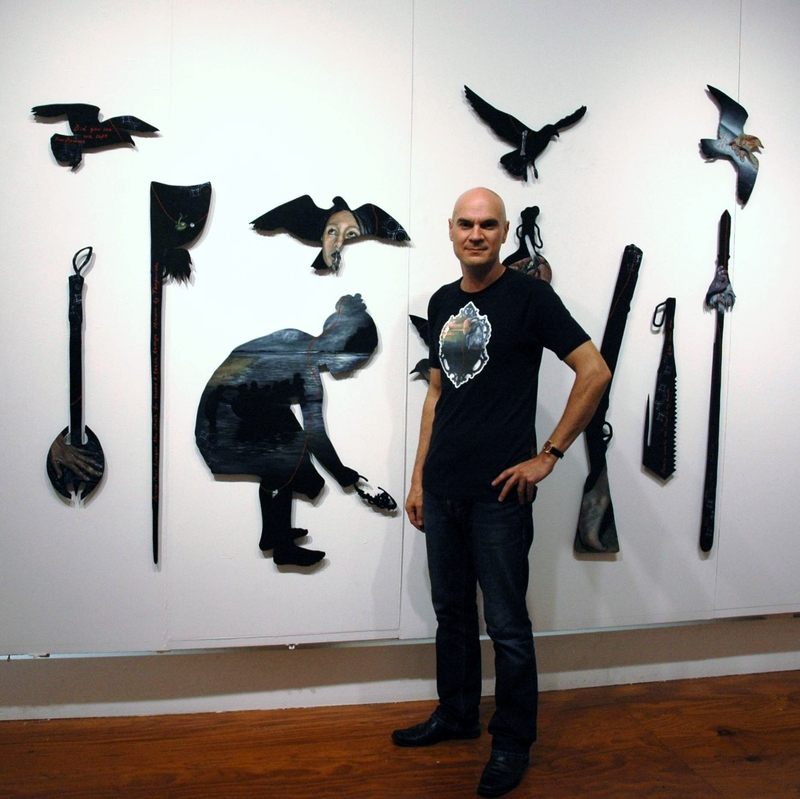 In 2009 Doug collaborated and co-produced Atarangi Whenua – Shadow Land with New Zealand Painter Penny Howard, a touring exhibition. Doug has been e-published in Trout, nzepc – OBAN 06, nzepc – Fugacity, nzepc – All Together Now: A Digital Bridge for Auckland and Sydney, Stalking Tongue Vol 2: Slamming the Sonnet, Soft Blow, Nexus Collection and other e-publications. Furthermore, he has been published in Niu Voices – Contemporary Pacific Fiction 2006 published by Huia Publishers. Landfall 218 edited by David Eggleton, Sidestream, edited by Miriam Barr. MP: Thank you kindly Doug for your time. I appreciate it greatly. You are of Samoan and European descent, please explain how the creative writing process began for you and how your dual ethnic background helped shape you as a writer/poet. DP: I started writing at high school. I was influenced by Malcom Hayward my English teacher, as he shared Roger McGough and Sam Hunt poems with me. The biggest influence to want to start writing however was seeing David Eggleton in performance at my high school, which changed my perception of poetry and poets. David’s work got me hooked on poetry. I began writing poetry in 1986 and have continued writing poetry ever since. Being of European and Samoan descent is something I am immensely proud of. Being so close to my Grandmother Edwina Ulberg as a child growing up, I immediately identified myself with “being Samoan” she gave me a great gift as an eight year old, taking me to home to Tulaele in Apia. However it was being in Samoa, not speaking Samoan, or looking Samoan, I guess when I first experienced an identity crisis. It is something I have written about ever since, it shapes my poetry, my world view and my values. After the commotion of meeting everyone, the boys settle in their bedroom while the evening meal is being prepared. Beyond the open window, the evening sky is hibiscus pink. The changing shadows and sounds offer a new world unseen by Posala or Sione before. All of a sudden the trees at the window rustle, and hushed giggling is heard. Posala and Sione move to the window and look out. There on the lawn are some of their boy cousins. They all look at each other, eyes wide open and mouths agape, turned up to laugh at any moment. ‘Huh! Who you calling Papalagi you, you naughty kids!’ yells Posala. ‘Hoo- Hoo- Ha- Ha- Papalagi- Papalagi” tease the kids. The boys dance around on the lawn in front of the window, laughing and opening their lava lavas’ and wiggling their bottoms at Posala and Sione. ‘Hoot- hoot- Papalagi- Papalagi,’ they chant in unison. Wiggling and slapping their bare bottoms, laughing even more. Just then, Grandmother Edwina walks into the room, and shoos the boys from the window. As the boys run off, Posala starts to cry. My Father is a child of two immigrants, my grandfather from London, England and my Grandmother from Tulaele, Apia, Samoa. I have always admired how he navigates the world, and it is his Samoan heart which I admire most about him. He is just, loving and generous (to a fault sometimes). So really My Father and my grandmother gave me a Samoan identity from a very early age. The enduring theme of my poetry and ongoing manuscript of “Samoan Poems” I call Pouliuli, is the expression of being Samoan and Afakasi. It is central to me as a writer/ poet. biscuit tin overrun with black ants. talofa lava and a kiss. in the pouliuli of blindness. as I shake ants from the tin. MP: Absolutely beautiful. I love how you weave your experiences into your short stories and poems. In continuation with your family, how has the role of being a father influenced your writing? DP: Becoming a father at the age of 21 was a life changing experience, I became immersed in family and my writing became focussed on family life and experience. I write poems for my children to navigate through the world with; poems that empower them and show they are loved. Now my children are teenagers, this hasn’t changed, however as they have grown I have chosen to explore and write about things more personal too, so that as they grew they would hear my stories, dreams and beliefs. Being a father only strengthened my resolve to become a published poet and short story writer, it gave me self-belief. A mouth full of many footsteps. holy blankets & rusted nails. to the living & beautiful dead. MP: Wow! That poem is moving. Thank you for sharing. Also, I loved how in your response to the question you stated: “I write poems for my children to navigate through the world with; poems that empower them and show they are loved”. That is a beautiful reflection of the foundation for your poetry work. Your partner Penny Howard is a superb visual artist and the creativity that you both share must be truly empowering. How does her artistry influence your creative writing? DP: My partner Penny Howard empowers me as a poet in many ways. She is the person who encourages me and takes interest in my poetry more than anyone in my family or peer group. She has helped me to believe in my ability as a writer and poet. MP: Thank you for sharing, the bond that you two share is truly special. You were a part of a poets group called “Polynation”. Can you please explain how this group came together, who was a part of it and the experiences (writing, live performances etc) that came with it. Tusiata Avia, Karlo Mila, Selina Tusitala Marsh, Serie Barford, Rev Mua Strickson Pua, Daren Kamali, Tim Page and I recorded poems at Auckland University. Tim Page recorded and engineered them. After listening to the sequence of poems I imagined a performance poetry show. I was heavily influenced by Tusiata Avia’s show “Wild Dogs Under My Skirt”. I pitched the idea to all the poets, Graham Nunn (director of the Queensland Poetry Festival) and Murray Gray of the Going West Festival. Their response was positive and began working with Tarisi Vunidilo at CNZ with our funding application, which was successful. I produced the show and Tusiata Avia directed it. Tusiata shaped the show into the incredible body of work it became. She coached us in performance techniques and gave us all the strength to believe in ourselves. Tusiata was our leader and our strength. I could not have done POLYNATION without her. MP: WOW! That is absolutely inspiring indeed. What a great way to work collaboratively with other amazing Pasifika poets. In reference to your poetry work, what do you want readers to take away from it? DP: Thank you. Well, I want my poems to give my readers a cinematic experience, I work hard to capture imagery within my work, I want to leave spaces for the reader to operate within too. Other works like AKA PC Bully I want to make the reader critique the work challenge them to evaluate my political view point. Overall I want the reader to feel something, be inspired to respond or just purely enjoy the poems. I work very hard at my writing and hope this comes through in my work. MP: I find that your poetry is inspiring in the way that you are able to paint images with your words. What would you say your three main bodies of works would be? Before I came to Niu Sila. I really love collaborating with others and so I write a lot Collaborative works. Penny and I have been very successful to date with our collaborations. As a rule we work independently, coming back to each other with a poem or painting based our discussions and dialogues we are trying to achieve within a theme or subject. Finally AKA PC Bully. It is the AKA PC Bully works my political and socio-political voice operates, these works are provocative, visceral, largely unedited and fulfil my philosophy that a poet must make the world they live in a better place, exposing or critiquing the world, politics and media. Eh, where are you going? MP: WOW! All 3 pieces that you have shared are both enlightening and empowering. Also, they provide a great insight into your work but moreso how we (as the reader) can view the world through your lenses. If you were to go and watch a reading/performance of poets whom you have never seen live before, who would they be and why? DP: Thank you. Well, I would love to travel the world and go to randomly selected open mic poetry readings and see, hear and feel the poetry of many different people who write poetry for the love of it. I am not a big fan of spoken word/performance poetry; it tends to be a monologue and lacks the poetic mechanisms I love about poetry. I am more interested in the poem and the poet than a performance. There is a precipice the poet stands above when they recite a poem. Whether the poet is a polished “performer” or a nervous novice, it is the moment of truth between the poet and the audience that I enjoy most about a reading/ performance of poetry. Three poets who I would love to see do a reading it would be, Hone Tuwhare, I wish I had seen him and met him; he is one of my all-time favourite poets. The other poet I would love to see is Janet Frame, I’m not sure she would have done a reading, but I would love to have met her and see her reciting poetry too. Lastly Luis J Rodriguez, he inspires me, he is real and keeps it real whilst employing a poetic language. I would love the trip to the USA to see him and finally meet in person. MP: Thank you for sharing that. It’s great to know exactly what it is that you love about poetry. Globally, there is a huge growth in the number of authors and poets who are now publishing their works online as opposed to publishing in the traditional book form. What are your thoughts on that? DP: I think it is great. Certainly online publications and e-books are lower cost to produce. Blackmail press is an online publication because it is a lower cost compared to a hard copy. Self-publishing is a valid expression for poets, because we all write to share our selves and our poems with others, why wait for the limited resources of a publishing company to do this. Work with peers to produce a well edited book of poems, get on line and publish it as an e-book, or book (lulu.com, Blurb.com). Or just print it up yourself. Publishing poetry is getting easier and lower cost thanks to e-publishing. MP: That is so true. So, for the readers who are interested in publishing their work online, what would your advice be for them? DP: Believe in your poems. Go out and do open microphone readings, read them to your friends and family, become confident about sharing your work. Be yourself. Like submitting works to a print journal, read widely each e-journals back issues; to get a feel for what they publish and decide if this is the place you want to share work. Keep your work to a high standard and ensure it is peer reviewed for errors and other basic “mechanical” things like grammar, spelling and tautology. I guess the old pearl of avoiding clichés is another thing. Editors like to see work of a high standard, originality and a work that engages them to want to e-publish it. 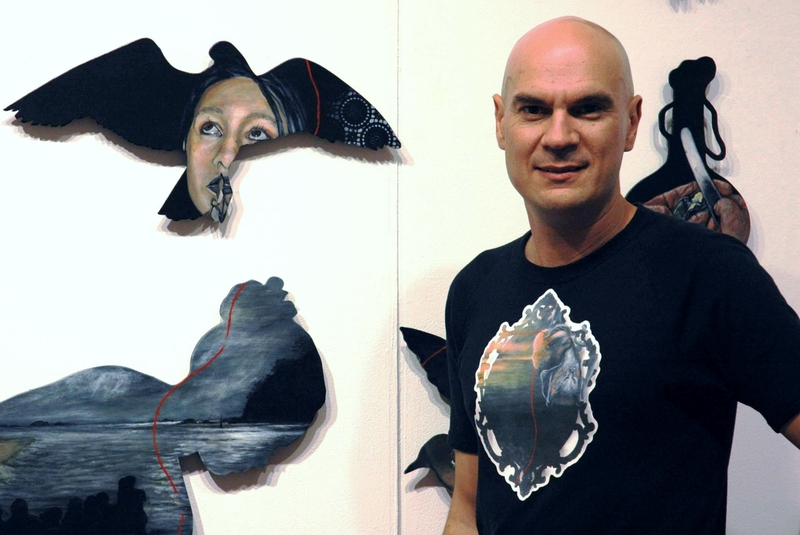 Poet Doug Poole standing in front of Penny Howard’s beautiful art exhibition. MP: Nice! That is great advice! Speaking of “editors”, what inspired and/or encouraged you decide to become the Managing Editor for Blackmail Press? DP: Thank you for asking. Well, I began blackmail press in 2000 as a response to Poetry Down Under an Australian website I had been submitting work to, I wanted to be able to share poetry with others outside of the constraints of publishers, academic journals and creative New Zealand funded publications. I wanted to create something courageous, eclectic and unique as a journal and I wanted to have a brand. Publishing online was very limited in 2001 it was a differentiator as far as publishing goes. It had, it seemed to me, great possibilities for form, content and international scope. So after befriending Christina Conrad and talking via a bad line between Woodstock, NJ and Te Atatu, Auckland, we resolved I should do it and she mentioned she could get Michele Leggot in the issue along with herself and Billy Marshall Stoneking. I asked friends from USA, Australia and New Zealand and we put out, albeit a very clunky and dated looking format, blackmail press 1 in June 2001, we have been going ever since. So, this year blackmail press is in its’ 11th year. My experience overall has been one of enjoyment. Producing blackmail press is my passion along with writing poetry and short stories. I love doing and being a part of blackmail press. It has afforded me great opportunities to meet and befriend poets from all over the world and the opportunity to put together Polynation and take to the Queensland Poetry Festival. I have made life long connections with other poets and artists. I just love putting the issues together, working with the poets and artists. I enjoy the whole process end to end. From reading through and selecting works to, designing the webpages, selecting the artwork and formatting the webpages, it satisfies so many different facets of my personality and creativity. MP: What an amazing story! You must be so proud! Over the past 11 years, have you noticed any difference in the works that have been recently published in comparison to earlier works published on Blackmail Press? MP: Thank you so much Doug for your time. I truly appreciate it! I have loved the fact that you have shared poetry in this interview. Would you like to end this interview with one more poem? DP: Thank you Maryanne for this opportunity to feature on your blog. I am grateful to you and I have enjoyed this interview. I would love to share one more poem. When my grandmother Edwina Ulberg- Stowers- Poole passed away I feared I would lose touch with my extended Aiga, and even worse, my “Samoan-ness”. Being so outwardly Afakasi, it is difficult for people to accept I am of Samoan descent. Yet I am a direct descendant of Tuailemafua O Safune Savaii, and the Ulberg Aiga of Tulaele, Apia, Upolo. My Grandmother’s parents Henry and Tuaoloa Uleberg were respectable Afakasi. At the turn of 20th century, Henry was a manager for DH & PG copra exporters, under the German administration, and then a Customs official, under the New Zealand Administration, until Samoan independance. “contemporization” of the traditional Samoan values. Yes they were Afakasi, yet they also lived by the rule of Faa Samoa whilst embracing the modern world. I am the product of toil and hope of two generations, part of an immigrant story, and familiar to so many cultures. I grew up within Samoan and English cultures, a collision at times, a celebration at others. Was it difficult? Yes, at times. The stories of how my Grandmother was treated when she first immigrated to New Zealand have never healed. I owe so much to my Grandmother and Great-grandparents; I have understanding of issues facing immigrants in New Zealand today. As a poet, I like to think I am a reconciliator for the past. son for the return home. he has never heard before. MP: This interview has been awe-inspiring. Once again, thank you so much Doug for sharing your work! Your work is nothing short of amazing! Malo ‘aupito! It is lovely to hear from you. Thank you for visiting my blog. I truly appreciate it. I am so glad that you read this post and provided your feedback. It’s beautiful to see that you appreciate Doug’s work. He is indeed a talented man and a humble one at that. Thank you for your kind words, I truly appreciate it. Have a wonderful week and I look forward to reading more of your work. Hi Maryanne, I really love how in this interview you open out a place where we can meet both Doug Poole and his work. I really appreciated the way he uses poems and stories to show us how his work has developed from his life. It gives me a better understanding of his work to see this range of poems together. Thank you for your kind words, I appreciate it. I am grateful to have been able to interview Doug Poole. He is a wonderful poet and humble man. To read your comment and to see the appreciation that you have for Doug’s works reaffirms my belief that featuring wonderful guests, such as Doug Poole, on this blog will inspire, encourage and empower readers. I am grateful for that. Thank you for visiting my blog. Have a fantastic week.